Following on from last week's post featuring Hilary Clinton and Jeb Bush, let's take a look at how the other US Presidential candidates are using PPC advertising to drum up support. 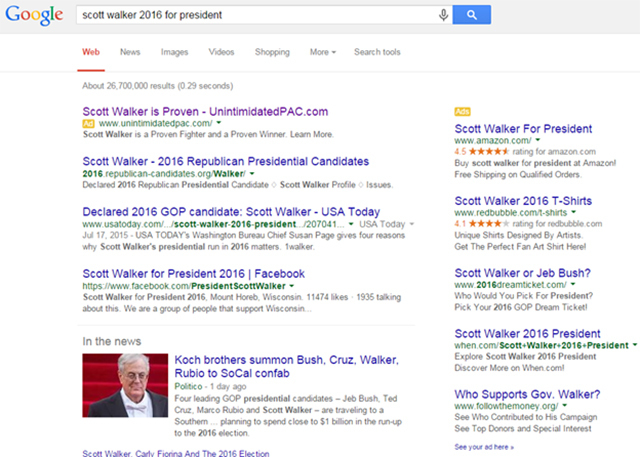 I did find the most competition on ads for Scott Walker, though- so much so that even Amazon is getting in on it! This probably isn’t a good thing, as competition on a term will typically drive up the CPC for each click Scott receives. Scott Walker’s landing page is the home page of his main site, which is something many PPC managers would consider a cardinal sin. In this case, I don’t see it as the worst move. 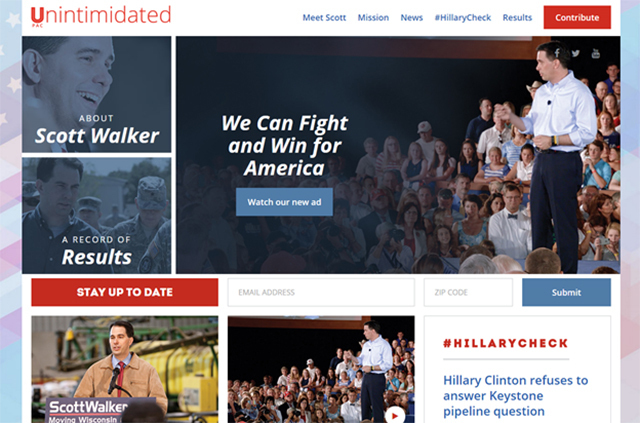 Unlike Hillary’s landing page, I can find whatever information I might seek about Scott, and while conducting a very generic search like “Scott Walker,” this could play to his advantage. The main critique I have on Scott’s strategy is that it’s not focused. A PPC campaign can be very powerful in directing a course of action, and Scott’s ad did a poor job of directing me on what to do when I get to the site. There are so many options for me to click on that it may be hard to pin down and evaluate the success of his PPC campaign. Rand Paul’s team goes all out with a highly emotive plea. But he’s not testing any ads, as this is the only one I could trigger. It’s possible they got the wording just right on the first go at it, but it’s statistically unlikely. The call to action in the ad didn’t really get across the idea that I’m supposed to make a donation, unless you call the “/donate” on the display URL a call to action. 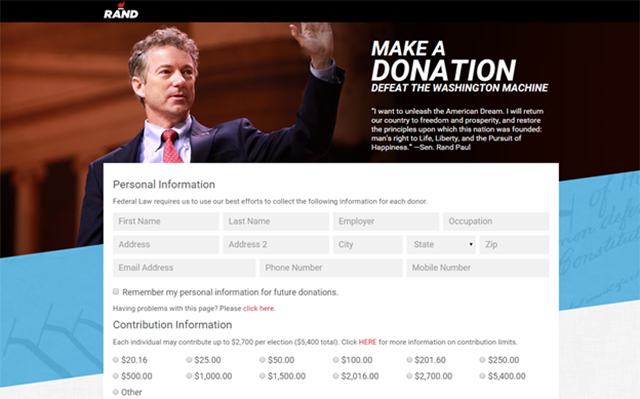 What I really don’t like about this landing page is that it makes donating to Rand’s cause seem like an awfully big chore by hitting me first with all of these form fields. Do they really need my employer and occupation before I make a meaningful donation? What about two different contact numbers? Maybe I can expect a personal thank you from Rand for my $20.16 contribution (clever), and he wants to make extra sure to try my mobile if he can’t reach me on my main line. In all fairness, it does say “Federal Law requires us to use our best efforts to collect the following information for each donor” above the donation form fields, and maybe this level of transparency is part of the Rand Paul package. From a conversion standpoint, however, this is just bad news. Similar to Hillary’s landing page, there is no navigation, but Rand does provides context by including an evocative quote, helping position his stance. Try for an easy sell – an email address could afford a lot more opportunities to market to an audience than a click to donation page. It’s going to be a long race, and broadcasting information over time directly to interested website visitors can be a powerful long-term strategy. Be clear about who the site is about and what they stand for. If I’m doing my due diligence as a voter and weighing my options, what better source of information about what the candidate stands for than from the horse’s mouth? Use ad extensions. I was a bit shocked that Hillary’s team was the only one employing ad extensions in the campaign. Since Google made ad extensions usage part of the Quality Score formula, it’s sillier than ever not to use ad extensions to provide additional information alongside PPC ads. PPC can be used for more than just bidding on a name, and I didn’t see any of the candidates I looked at using the medium at its full potential – to connect people searching with the answer they seek. For example, if I’m doing a search for “Jeb Bush Economic Policy”, I’m greeted with the same ad as when I searched his name. This is a potentially squandered opportunity as it would allow the candidate to directly respond to a citizen’s concerns – almost resembling a dialog between the candidate and the voter. This will be especially powerful if a particular topic heats up. For example, if there is a controversy of any sort, a candidate could own the topic and meet it head on with their ad, with their retort, and with their spin. 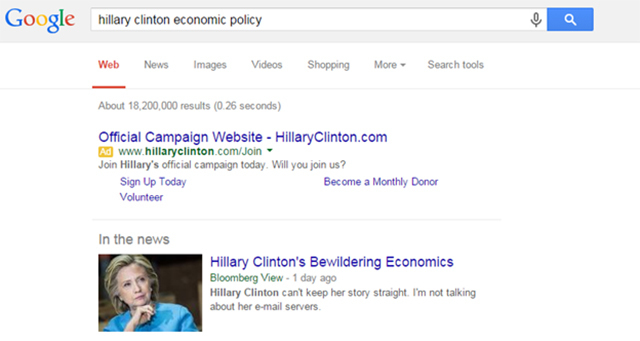 An example can been seen when I do a search for “Hillary Clinton Economic Policy.” The first news article below the paid ad is a news link which takes a shot at Hillary’s economic policy in its headline. It also makes for a more attractive click for my query because my question to Google is addressed by the article, not by her ad. There will be many more examples of this in the long race ahead, and it will be impossible to stay on top of them all, but there will be some core issues to that come to a head. It’s still early in the race, but the real opportunity of PPC marketing to our presidential candidates of 2016 is PPC’s speed to market and its ability to test in a live market for nearly immediate feedback. Any candidate can launch an ad for a keyword at any time. Not all keyword choices will be “profitable,” but that’s why their teams should be actively testing and getting a workflow together now. They should be testing not just ads or keywords, but also landing pages, calls to action and presentation of information. With great execution of PPC marketing, winning the hearts and minds of American voters in 2016 could happen one well-placed ad at a time. 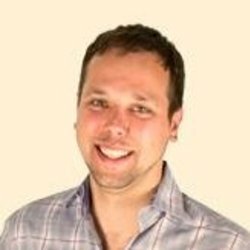 Nathan Pabich is the Director of Paid Search at Digital Third Coast, a search engine marketing company based in Chicago. You can find Nathan on Google+. Connect with Digital Third Coast on Google+.